If you have a major bug and i didnt notice it on the issue tracker or on the comments section feel free to poke me on twitter. - IMPORTANT : If the screen is too big for your game screen, you have two options. -- change to GUI SCALE: NORMAL or bigger. - In other words, it works with baubles, custom npcs, inventory control keys, thaumcraft, balkins weapons, etc etc. - No more compass, clock, uncrafting, 3x3 crafting, or exp bottles. Some of these may return depending on user demand. I moved the Uncrafting feature to a standalone mod "Uncrafting Grinder" and made tons of fixes and updates. - Still works with all screen resolutions, so for GUI Scale Small or Auto you can use the config file to make the screen smaller. - Please give me your bugs, features, and comments ! - There is also a .opibk bakup file, replace the original with this file RIGHT AWAY if there is a problem. Please report any bugs for the 1.10.2 version to the github issue tracker (link above). - Expands your inventory space to three different larger sizes, the default 'normal' is 15 rows by 25 columns = 375 total slots. - Adds four special slots to hold ender pearls, ender chest, clock, and compass. -A keybinding is added to use the ender pearl from this slot (regardless of what is in your hotbar). 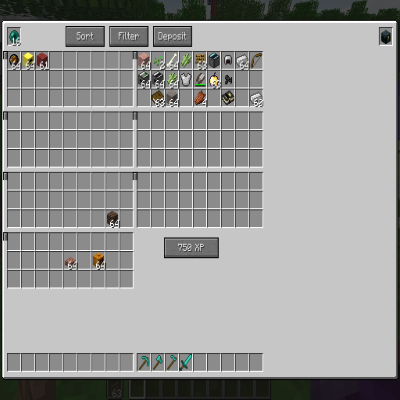 - You can store experience by filling Bottles o Enchanting by putting empty bottles in a special slot in the far right. The two buttons on the top right deposit your items into nearby chests automatically. This is not a 100% lossless conversion, since Bottles o Enchanting give randomly 3-11 exp. By default, it costs 10 exp to fill a bottle; change this in the config file. - Arrow buttons cycle inventory left and right, or push them all to one corner. When a chest or other container is open, you only see the first row and a bit squished in just like the normal combined inventory. - Two special buttons in the top right will deposit your items into all nearby chests all at once with a single click. 'Merge' will only add to existing item stacks (for example, a chest with one cobblestone and nothing else will get that cobble filled up with 63 more, empty slots in the chest are ignored and other items are ignored). Deposit all will dump everything possible. By default this only uses chests up to 12 blocks away; this can be tweaked in the config file. It does use both trapped and regular chests, but no other containers. - When opening any other vanilla container, the top right has two buttons, the first to go to your inventory, and the "X" to close. - By default, ender pearls have been buffed to stack to 64; you can revert this in the config file to send it back to 16. - Tested in SSP, SMP, with and without keepInventory gamerule. Even so, please BACK UP your worlds before installing (goes for every mod, not just this one). - Using this while in CREATIVE mode will have some weird issues, the armor slots and lots of other stuff gets messed around, it is intended for SURVIVAL. Please let me know if you have any ideas for additions to the mod, or if anything crashes or goes wrong. Version 1.0.12 had a few bugs so I removed it from download. For example, it crashed your game when 'Uncrafting" certain items. - New in game configuration GUI (MC1.8 only) use the 'config' button inside the 'mods' button on the main menu. - New options to allow all sorts of items stack up to 64 - boats, doors, cakes, and more. Can be disabled in the config. - Large size screen option is new, before was only normal and small in the config file. Large is 16x28 = 448. Way more overpowered than normal! The old "normal_small" config entry is now just "size" and it can be normal, small, or large. - Config to hide outlines of empty slots - some users get black squares or other graphic artifacting. - Config entry for Compatibility mode - for users with mod conflicts. Currently this is very limited, it will hopefully get expanded on if enough people are actually using it. Version 1.0.7 had a missing texture and was removed sorry everyone my bad. - New uncrafting slot and button - looks up recipes on the fly. Does not work with things like crafting tables, because there is no way to know what kind of wood was used. - Fixed some visual issues with the smaller version of the ui. - New sort button added in the lower right. Will toggle between two sort types. - The Fill and Ender chest buttons are hidden if not useable. Reminder: always make world backups! Have you thought about porting this mod to fabric loader and for use on latest snapshot 19w09a? Just curious, I would love if you could or would. If not it's fine. Fabric loader fixed my controller bug issue so I don't want to really move back to forge. Plus easier to install IMO. Does this mod need to be downloaded by everyone or can it be server side? There's no way to craft or move items to chests directly from overpowered inventory? And from what I saw you can only swap your entire invetory to move or take back items.. Is not possible to see the overpowered inventory and the default inventory at the same time..
Also I do not understand what the purpose of the slots of ender chest and pearl, what is the difference of them to the other slots? I have an error: For some reason, when I open up the menu it is slightly zoomed in, but to the point where I can't see many of the options (See picture below) How do I fix this? you change to this: "B:is_large=false"
I'm developing a modpack and would like to include this mod, would that be okay? I'll link back to it of course, but if you have any other conditions feel free to tell me aswell. Denying is ok too, of course. Is there any way for the ender chest slot to accept say the ender chest or ender pouch from ender storage? This is an awesome mod, thanks! Does OPI support tool tips, I can't seem to get it to work, no options in config? I have blocks like block of coal, black wool, obsidian that all look the same with out the tool tips it's hard to know what is what unless I put it into my normal inventory or keep a specific organization in OPI. Is it possible to limit inventory into just only at hotbar? Hey, i think i found a bug or issue at least. Whenever i go from one dimension to another like in my case Aroma's mining world and the overworld my inventory progression reset by that i mean i need to pay the xp cost again over and over every single time. Once i get one of the upgrades back all my slots get "refreshed" and they all reappears plus one. so i basically can get them all for 50xp the base cost. It might be a player save problem on my side since is transfered the solo world into my current private server. I'll investigate further and post if i find anything Thanks for that super awesome mod . I lost all of my inventory when transferring it to a chest. Looks so interesting, but don't work correctly for me. If I press B a window appears, but it doesn't look like about (see picture). Pressing B again don't close it. Would it be possible to get a config option to replace one of the 6 buyable inventories with a copy of the main inventory that's always there ? I know that there's a button on each of the buyable inventories to move all of your inventory contents to that inventory, but would make it MUCH easier to move items around from your inventory to the other inventories - would gladly give up an extra inventory for the increased convenience. A config option to switch off the 2nd hotbar would be good too. Also, how do you open the ender chest once you've placed it in the ender chest inventory slot ? play full screen and the Overpowered Inventory box is to big. you can't use it at that size. same problem, I have to play with a small GUI to be able to use it, can you please shrink it down, possibly opening a second or third tab upon unlocking further inventories? no can do. shrinking the GUI size makes my game lag a lot. the smaller it is, the more the game lags.